This is one of my favorite foods of all time and I especially love it in sandwich form, so this is a two-part blog. Caprese salad is of Italian origin and is absurdly simple to make. It’s just fresh tomatoes, fresh mozzarella, fresh basil, and a little dressing. It’s just a great dish for when tomatoes and basil are in season (great out of season too, who are we kidding?). I can’t remember the first time I had a caprese salad. I just know that from that point on, I needed to make it at home every now and then. A couple of years after having my first taste of the salad, I tried my first sandwich in Boston at a pizza and sub shop in Center Plaza near government center. I think the place went out of business, but they used to have a great caprese and prosciutto sandwich with a balsamic dressing. The cured ham really makes a great salty addition to these fresh ingredients. The ham balances out the almost too fresh/light taste of the salad and mozzarella alone by giving it a heartier quality. 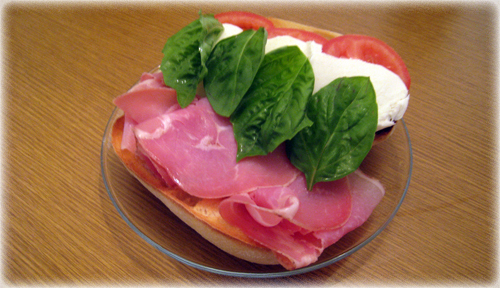 Below are my two recipes for a simple caprese salad and a caprese salad sandwich with prosciutto. Note: Make a couple of stacks of the ingredients and skip the bread for a more traditional caprese salad. Note: You don’t have to have this sandwich with prosciutto, but it is highly recommended that you do. Optional: Salt and/or pepper to taste, but I don’t use any myself since the prosciutto is pretty salty. Slice three medium-thick tomato slices. Set aside 3 – 4 pieces of fresh basil. Lay down a piece of tomato on a plate. Stack a piece of basil on the tomato. 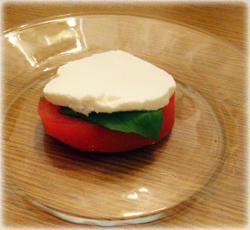 Place a mozzarella slice on the tomato and basil. Repeat steps 4- 6 two more times and build the tower higher. Note: You can also just overlap the ingredients and create an arc or spread them out across the width of a plate instead of making a tower. Drizzle 1/2 or 1 teaspoons of balsamic vinegar over the ingredients. Drizzle 1/2 teaspoon of olive oil over the ingredients and add salt or pepper to taste (I don’t add salt or pepper usually though). Serve cold and eat as a great pre-meal salad. Serving Suggestion: Add a layer of prosciutto on top of each mozzarella layer for a heftier caprese salad. Slice the Portuguese roll horizontally in half (or you can leave it hinged by not slicing all the way through). Place the roll into a toaster oven and toast for a few minutes until the inside is browned a bit. Take 3-4 slices of prosciutto and lay them on the bottom half of the bread by folding each piece over on itself making a kind of fluffy or wavy layer of meat. Slice three medium-thick tomato slices and lay them on the top half of the bread. Slice 3 pieces of fresh mozzarella (about 0.5 oz. each) and lay them on top of the tomatoes. Place 3 – 4 fresh basil leaves on top of the mozzarella (feel free to roughly rip up the leaves as well). Drizzle 1/2 or 1 teaspoons of balsamic vinegar over the basil and a little on the meat. Drizzle 1/2 teaspoon of olive oil over the vegetables and cheese. Lastly, close the sandwich and enjoy!